I you have a paid vSphere license under subscription then you can download ESXi 6.0 (and all other vSphere 6 components that you are entitled to) from the My VMware Downloads page. Even if you will use ESXi only with a free license key you will need a My VMware account for the following steps. If you are already running ESXi then you most probably already have one - if not then register now. It's easy and free. The free license offering has already been updated to 6.0, so you can then go to the vSphere Hypervisor page to register and download ESXi. There you will also find the license key that you need to enable the features of the free version after installation. The ESXi installation image can be downloaded in two different formats: On the one hand there is the ISO file (named VMware-VMvisor-Installer-6.0.0-2494585.x86_64.iso) that you just burn to a CD media and use to boot your machine and install or upgrade ESXi on it. On the other hand there is the Offline Bundle (named VMware-ESXi-6.0.0-2494585-depot.zip) that you can use to update ESXi directly from the command-line using esxcli. You also need the Offline Bundle to customize the ESXi installation and build your own installation ISO (e.g. with additional drivers). Unfortunately the Offline Bundle is - right now - only available to you if you have a paid vSphere license under subscription registered with your MyVMware account! On the download page of the free vSphere Hypervisor you will only find the ISO file, and even if you register for a vSphere evaluation you will not be able to download the Offline Bundle, but only the ISO file. Confused already? Here is another option: A different way to download ESXi is through the VMware Online Depot. The primary purpose of the VMware Online Depot is to serve as a synchronization source for VMware Update Manager (VUM), the product that you use to patch/update ESXi hosts that are managed centrally through vCenter. However, since it is all about patching the ESXi 6.0 GA bundle is usually not available in the Online Depot right away at the GA date, but is added there some time later (at least this is how VMware handled it for the release of ESXi 5.5). My new service, the ESXi Patch Tracker, can notify you once the ESXi 6.0 GA bundle has been added to the VMware Online Depot, because it does nothing else than querying exactly that. I suggest that you subscribe to its RSS feeds and/or follow its Twitter Bot @ESXiPatches to get the news just in time! The workaround described in the following sections and any software package that you install through the V-Front Online Depot are neither endorsed nor supported by VMware! Use at your own risk and never on production systems! When VMware released ESXi 5.5 in 2013 they decided to drop some drivers for NICs from it that are commonly used in consumer grade hardware: r8168 and r8169 for Realtek chips, sky2 for Marvell chips (and less common: s2io for Neterion 10Gb cards). Luckily you could still keep them installed when upgrading from ESXi 5.1 to 5.5 or install them later on top of ESXi 5.5. With ESXi 6.0 VMware goes a step further and actively prevents installing these drivers by using a blacklisting method that is based on VIB package dependencies! The ESXi system package misc-drivers is flagged to replace the above mentioned driver packages which means that you cannot install misc-drivers and any of these drivers - misc-drivers though is absolutely necessary for ESXi so you must install that! As a workaround I created new packages that just includes the driver files of the net-r8169 resp. net-sky2 packages, but use a new and different name: net51-r8169 and net51-sky2. As a replacement for net-r8168 please use the updated net55-r8168 driver! After a reboot your host will work exactly as before. net55-r8168: As stated above it is safe to keep this driver with ESXi 6.0.
net-e1000e: This driver by GLRoman updates the ESXi builtin e1000e driver and supports additional Intel Gigabit NICs. In ESXi 6.0 VMware has also updated its own e1000e driver, and - as fas as I could check that - the VMware supplied version in ESXi 6.0 now supports the same set of devices as GLRoman's driver. However, please do not uninstall GLRoman's driver prior to the ESXi upgrade, because this could potentially render your host unable to boot (because of "no supported NIC found"). Instead follow the clean-up steps below (section 5) after the upgrade! net-tulip: This package allows to run nested ESXi hosts under Microsoft's Hyper-V. I have not tested that, but I expect that it is safe to keep that and that it will still work with ESXi 6.0.
sata-xahci: This package enables support for additional SATA AHCI controllers. It is still required with and compatible with ESXi 6.0. Keep it if you have that installed. cpu-microcode: This package updates CPU microcode files. It is incompatible with ESXi 6.0, but you do not need to uninstall it prior to the upgrade, because ESXi 6.0 comes with a VMware-supplied package with the same name, and that will just replace the community supported package. fw-ntpd: Adds an ESXi firewall rule to allow incoming NTP traffic. The firewall subsystem has not changed in ESXi 6.0, so this package is still compatible and functional with 6.0.
vmware-esx-dvfilter-maclearn: Another cool VMware fling that is very useful in nested environments. According to William Lam it is still needed in ESXi 6.0, but none of us has already tested if it is actually still working with ESXi 6.0. At least it survives an upgrade, and it looks like it is safe to keep it. ib-opensm and iperf: Raphaël Schitz - the author of these packages - will test them on ESXi 6.0 and let us know if they are compatible. I cannot make a recommendation for them right now, sorry! 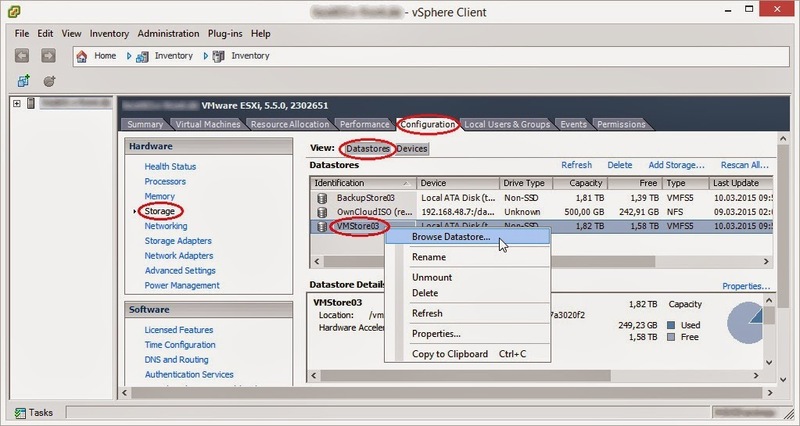 Host Configuration - Storage - Datastores - Browse Datastore...: Note the datastore name ("VMStore03" in this example)! In the datastore browser window select the root directory (/) on the left, click on the Upload icon and select Upload File... from the dropdown list. A file selection dialog will pop up now: Select the Offline Bundle from your local hard disk and it will be uploaded to the datastore then. In the command string replace VMStore03 with the name of your datastore! Wait for the command to complete successfully. Then reboot and enjoy! If you are unable to get your hands on the ESXi 6.0 Offline Bundle and only have the ISO file to your avail then you can still upgrade your host by booting it from the ISO and following the built-in upgrade wizard. I have quickly tested that method with a nested ESXi 5.5 host, and it yielded the same result as the Offline Bundle method - the net51-drivers and sata-xahci packages that I installed before the upgrade were preserved! press Enter to reboot to the upgraded system. Please note: If something goes wrong and your system turns out to be unbootable after the ESXi upgrade then it should recover itself by rebooting again from the alternate bootbank that still contains the old system state. 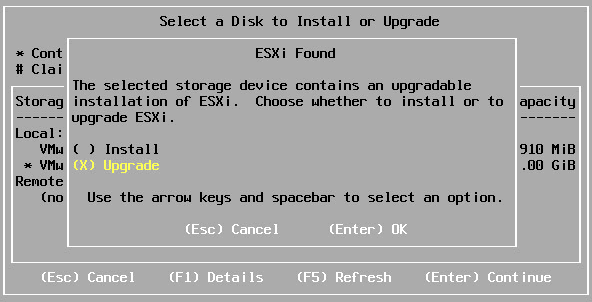 You can also manually fail back to the old state by following the KB article Reverting to a previous version of ESXi. Use the same path to the ESXi 6.0 Offline Bundle (following -d) that you were using for the upgrade! A reboot is required. in a PowerCLI session. You need to specify the full path to the ps1-script (at the beginning) and the full path to the Offline Bundle (following the -izip switch)! In this example the script is stored in the directory C:\scripts and the Offline Bundle is in C:\TEMP. This command will create a customized ESXi 6.0 installation ISO in the current directory that has the net51-drivers and sata-xahci packages built-in. You can as well add any of the other packages that are available in the V-Front Online Depot by specifying their names in a comma separated list after the -load switch! A while ago I wrote about USB 3.0 support being introduced in ESXi 5.5. Good news: This is also available in ESXi 6.0. Even better: On my test system the xhci-xhci driver that provides this support was loaded automatically on boot, so the workaround of editing the local boot script /etc/rc.local.d/local.sh is no longer needed. This is the first version of my Ultimate guide to upgrade your white box to ESXi 6.0 - I hope you like it! I will complement it with a follow-up post as soon as the ESXi 6.0 GA Imageprofile is available in the VMware Online Depot (which will make upgrading ESXi and using ESXi-Customizer-PS even easier). And I will update this post with whatever information adds value. Please comment if you miss anything or have specific questions! Good news: If you use the new free VMware Software Manager tool to download ESXi 6.0 then your downloads will include the ESXi Offline Bundle - even if you have registered for the vSphere evaluation only! Is there any reason for Free users to upgrade from 5.5? As I read through your posts about 6.0 I didn't find anything really new and great. My guide is not only for free license users, but also for those who use paid or evaluation licenses in lab environments. But please keep in mind that the cpu-microcode package from my depot is not compatible with ESXi 6.0. I will look into what microcode updates are included with ESXi 6.0 and if I can make a compatible version of my package if needed. Vsphere viclient 6.0 keep getting the vmwareremoteconsole.dll cannot be registered. Do paid 5.5 keys work with paid 6.0? No, you need to upgrade them in the MyVMware portal. This is for free if they are under subscription. 1). What about those who wish to install ESXi 6.0 from scratch but using 8168,8169 NICs? Does ESXi Customizer v2.7.2 can inject net51-drivers in VMware .ISO as I used to do in 5.5 ? 2), May I upgrade my ESXi 5.5 to 6.0 or should I upgrade first from vCenter 5.5 to 6.0 and then proceed with ESXi upgrade ? 1). see section 6 of my post. You need the Offline Bundle, or wait until the Imageprofile becomes available through the VMware Online Depot. The legacy ESXi-Customizer tool might also work (or not). 2). When using a vCenter server you need to upgrade vCenter before you upgrade any hosts that are managed by this vCenter server. With ESXi-Customizer v2.7.2 I succesfully added VIBs "net51-drivers" and "sata-xahci" to the free vSphere 6.0 ISO. Installation went well on my system with 8168 Realtek NIC. Hi, thanks for the great article! I have a question regarding Adaptec raid drivers. I had downloaded a driver from https://my.vmware.com/group/vmware/details?downloadGroup=DT-ESXI55-PMC-AACRAID-52140700&productId=353 and integrated it into VSphere 5.5 with your ESXi-Customizer-PS-v2.3.ps1. Now I see at https://my.vmware.com/group/vmware/details?downloadGroup=DT-ESXI60-PMC-AACRAID-62140709&productId=490 that there is a new version for VSphere 6. How can I integrate it into the image downloaded from VMware (since the online depot does not provide 6.0 yet) and will it replace the old version of the driver? Thanks! you can get your hands on the ESXi 6.0 GA Offline bundle by registering for a vSphere evaluation and downloading ESXi through the new Software Manager tool. I just updated my post to include this new information (see bottom). Thanks that this site exists, it already helped me back with ESXi 5.5 to install on my X10SL7-F mainboard (using ESXi-Customizer to include Intel IGB NIC drivers). Although since 5.5u2 (specifically since build 1881737) I have the problem that ESXi wont start sucessfully anymore. I now also have this problem with a clean fresh ESXi 6.0.0 installation. Is this some sort of incompatability with my Mainboard? Although from official knowledgebase I only read that build 1881737 (first build that did not work correctly) there was only a bugfix in esx-base for a NFS problem? My mainboard has an Intel i210AT NIC if that matters. I do not get purple screen or other error messages, boot sequence (beginning with vpxa, sfcbd-watchdog, wsman, vmtoolsd) seems to take ages and apparently never complete (hangs). Did someone encounter a similar problem? Apparently it seems it was a hardware problem. Used a StarTech CF-Card RAID1 Mirrored device for the Host, replaced it with a standard 2,5" hard disk drive and everything boots as normal!? Thank you very mutch the NET51 pack! Our custom Asus based macine has a Realtek network card so now it's working with 6.0. We have other two HP DL380 G6 servers. The first cannot contains any HDD the ESXi run from usb drive and the storage come from iSCSI. When I upgraded from 5.1 to 5.5 I used the standard image so I think I can use this method for 6.0 too. But we have another one HP which contains RAID controller and SAS disks in logical volume. I would like to ask shall I use the standard 6.0 image and when it upgrade the system it keep the RAID drivers or download HP custom image and inject somehow into the 6.0 offline boundle? for HP servers you should just use the HP customized ESXi 6.0 ISO or Offline Bundle for upgrading. You can find the download links on my HP&VMware Links page. I found the answer: To list out the image profiles that are contained in the offline bundle using esxcli. Maybe you could add that somewhere here? Ok I came across this AFTER my failed ESXi 6 upgrade...lol, I am also using shuttles and use my internal nics (reltek 8168) for management and a Intel dual nic for the vm's. Is it too late to fix this issue? I'm up and running but had to switch the mgt nics to one of my Intel ports to connect to it. no, it's not too late. You can still install the net51-drivers package (like explained) in my post to re-enable the NIC, or the net55-r8168 driver which also works fine with Realtek R8168 NICs. And what about the Atheros AR8151 driver ? what Atheros driver? I'm not aware of that one!? Thank you. Thank you. This article saved me. Especially the Shift-R as I upgraded BEFORE I setup the 8168 nic vib for 6.0. I was able to roll back and do it the right way as you show here. thanks ! absolutely magnificent ! Amazing. I used your net55-r8168 package to get my Realtek 8168 network adapter working on an ESXi 6.0 install. Since then, there have been some patches released with newer build numbers. What's the correct way to apply an ESXi 6 patch, such that the net55-r8168 package will be preserved? please see instructions at https://esxi-patches.v-front.de! and this will preserve the net55-r8168 drivers, correct? Thanks for taking the time to verify this. 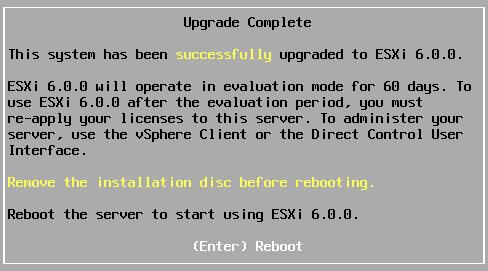 I can confirm that I was able to update to ESXi-6.0.0-20150704001-standard using this procedure. The net55-r8168 drivers remained untouched :) Cheers! Thank you for your guide, this was really helpful, and my ESXI whitebox server is updated to ESXI 6 now. really appreciated. Like some others, I came across this post after a failed 5.5 to 6.0 upgrade. The scan detected unsupported devices 8086:107c and 8086:1376. I have an old HP xw8400 workstation that I added two NICs to that may be the culprit. Intel Corporation 82574L and Intel Corporation 82541PI. Do you have a driver package for these NICs? The HCL for 6.0 still has the 82574, so I think it's just the 82541.
warning messages about unsupported devices during upgrades are warnings only. The devices will continue to work nevertheless, and you do not (yet) need a custom driver for them. BTW "8086:107c 8086:1376" is really one ONE device that it warns about. 8086:107c is its PCI vendor:device ID, and 8086:1376 is its subvendor:subdevice ID. This device is still usable with the ESXi built-in e1000 driver, so nothing to worry about! I appreciate the reply, Andreas. The upgrade attempt yielded an error: "Hardware configuration of host is incompatible". When I check the scan, it gives the same device IDs as above. So it appears that I cannot upgrade to 6.0. I am attempting the upgrade from Update Manager with an imported ISO (I have tried the "vanilla" and the HP provided ISO). That's too bad ... You can also try to upgrade using the Offline bundle or directly from the Online Depot (see http://www.v-front.de/2015/04/esxi-60-hits-vmware-online-depot-what.html). Thanks for all your work on this! I used the VMware Software Manager to download ESXi 6.0 but couldn't identify the offline bundle anywhere. Does your update note from (2015-03-31) still apply? I have realtek nics that aren't supported, and am doing a clean install of 6.0, so need to integrate the drivers into the install iso. Really need to get my hands on the Offline Bundle ASAP! you can now also build your own Offline bundle using my ESXi-Customizer-PS script. See here: http://www.v-front.de/2015/04/esxi-60-hits-vmware-online-depot-what.html, section 3. Hey, wanted to say thanks, as this allowed me to get ESXi 6 installed. I was wondering if you had any feedback on getting a 2nd NIC installed though. I have 1 NIC on the motherboard, and 1 as a PCIe Card, both of which use the r8168 driver, however I've had absolutely no luck getting ESXi to install the PCIe NIC. it took me some tries, but I have successfully installed esxi 6.0 on a Dell Vostro V131 using the net55-r8168 drivers. Thanks a lot for your guide, I had actually lost hope I could do it. Is there any risk of overwriting your custom drivers if I apply the latest ESXi update? I've noticed that there are several driver packages in the latest update from VMware. Only if the VMware supplied driver package has the same name (e.g. "net-e1000e") AND a higher version number than your custom driver package. And if that really is the case then the VMware supplied driver will usually support the same set of (or more) devices than your custom driver. So unless there's a vib listed on the ESXi 6 update page named 'net55-r8168', there's no risk of overwriting the v-front.de driver package? I successfully setup ESXi 6.0.U1b on 2 Shuttle DS81s with Realtek 8168 NICs. I don't know if something changed with the later versions of 6 but using your script and new 8168 drivers would not install correctly from scratch. I had to use your script and the new drivers with the latest 5.5. Then the only way I could get 6 on was your offline bundle method above. Everything worked but I tried doing the direct upgrade to 6 using the standard ISO only to have the install fail saying no NICs were found. I don't know if the problem I ran into was trying to go straight to 6.0U1b or if something has changed since you wrote this. Either way thanks for the information. It took a little trial and error but my servers are up and running on 6.0.U1b with dual Realtek NICs. I'm not sure why this would not work. Can you share the command/parameters that you used for creating the ISO? I have a PC based on ASUS P5Q Pro motherboard: Embedded Network Card is Atheros chip (PCI IDs: 1969:1026). This Network Card is listed as Atheros AR8121/AR8113/AR8114 PCI-E Ethernet Controller in Windows 7 Device Manager. I had planned to install ESXi 6.0 U1b for testing purposes in VMware Workstation 12 Pro. I downloaded Net-atl1e drivers from https://vibsdepot.v-front.de/wiki/index.php/Net-atl1e and created a custom ISO Image via ESXi-Customizer-PS / VMware Image Builder (I tried two ways: 1) Offline bundle 2).\ESXi-Customizer-PS-v2.4.ps1 -v60 -vft -load net-atl1e online option). I also check with the command Get-ESXSoftwarePackage that the driver net-atl1e is successfully integrated (AcceptanceLevel CommunitySupported). But the problem persists - I get an error again: No network adapters detected. The driver Net-atl1e isn't suitable. How to solve the problem, where is correct Atheros driver for ESXi 6.0? PS. The problem 'No network adapters' doesn't exist for VMware ESXi 5.5 Update 3 (It's OK, no Custom ISO Image required). if you install ESXi as a VM inside VMware Workstation then you don't need any drivers of your native hardware, because ESXi will only see the hardware that is emulated by VMware Workstation. Just configure the ESXi VM with an e1000 NIC and installation will succeed with the regular VMware ISO (no additional drivers needed). If you want to install ESXi directly on the ASUS system then you would need the Atheros driver. Did you try that already? Thanks! Indeed, the drivers for the native network card is not required: VMware Workstation emulates a network card of another type. as an AMD PCNET PCI adapter or Intel Pro/1000 MT Server Adapter". But there is no direct choice of the generated virtual adapter type. I checked the virtual machine configuration file (vmx): ethernet0.virtualDev = "e1000"
I used the native image ESXi 6.0 U1b. I get an error 'No network adapters' and installation cann't continue. I tried to integrate drivers from https://vibsdepot.v-front.de/wiki/index.php/Net-e1000e via .\ESXi-Customizer-PS-v2.4.ps1 -v60 -vft -load net-e1000e, but there is no result, the problem persists. Hmmm, not sure. Works for me, I just checked that. Is there actually a NIC displayed in "Edit Virtual Machine Settings..."? Can you just start over and create a new VM? I tried to re-create the virtual machine from scratch. When it was created no choice of emulated virtual adapter type. Available settings: Bridged / NAT / Host-only / Custom (Specific VMnet Network Connection) and Device Status (Connect at Power on), thats all. VMware Workstation 12 Pro (12.1.0). Considering I was using the offline package update-from-esxi6.0-6.0_update02.zip I was suprised to see "Update: 1"; I was looking for a 2 and am wondering why. On the vSphere Client I get ESXi 6.0.0 Build 3568943.
it looks like you used the "security-only" Imageprofile ESXi-6.0.0-20160301001s-standard of Update 2 to update your host. You should use the "full" profile ESXi-6.0.0-20160302001-standard instead. ...much better; that little s made all the difference. Thanks again Andreas! I'm having some problems with the script when trying to create a custom image file for ESXi 6 Update 2. I have a Realtek NIC 8168, and never had issues before with your script up until this point. The script itself doesn't exit on error, but provides several warnings, and when booting from the image, it will freeze indicating something is wrong with the image. you are trying to add the original net-r8168 package by VMware, but this is blacklisted (like explained in my post) and does not work. Please add the package net55-r8168 instead. Everything works. Thanks so much again for all the great work! Looks like I have hit a wall.. WARNING: The image profile fails validation. The ISO / Offline Bundle will still be generated but may contain errors and may not boot or be functional. do NOT add the net51-drivers package. It's obsolete and replaced by some of the others that you are also adding. See https://vibsdepot.v-front.de/wiki/index.php/Net51-drivers. So is there a way to install realtek drivers for ESXi 6.5? [[email protected]:/tmp] esxcli software vib update -f -d "/tmp/net55-r8168-8.039.01-napi-offline_bundle.zip"
This message means that the package is already installed. You probably upgraded from 6.0 to 6.5 and the driver got preserved, and it should still work fine. VIB Realtek_bootbank_net55-r8168_8.039.01-napi requires vmkapi_2_2_0_0, but the requirement cannot be satisfied within the ImageProfile. VIB Realtek_bootbank_net55-r8168_8.039.01-napi requires com.vmware.driverAPI-9.2.2.0, but the requirement cannot be satisfied within the ImageProfile. upgrade to ESXi 5.5 first, then install net55-r8168, then upgrade to 6.0 (or 6.5). It is failing to fetch net51-r8169. I cannot find the similar net55-8169 on your repo either. I managed to install with just net55-r8168 and upgraded to 6.0. Lost one NIC port but i had one extra so i switched. that works for me. The net51-r8169 package is in the depot and accessible. What error message do you get? erst einmal ein großes Lob für die Seite. Vllt. kannst du mir helfen? Ich versuche das Upgrade von 6.02 auf 6.5, allerdings zeigt er mir keine meiner Platten mehr an. Ich habe ein MSI Z68I Board, der AHCI Treiber wird durch ESXi von Hause aus unterstützt. Den Realtek Treiber habe ich in das ISO eingepflegt. Nach meinen Recherchen sollte eigentlich alles unterstützt werden, halt bis auf die NICs. möglicherweise gibt es ein Problem mit dem neuen nativen AHCI-Treiber. Versuche ihn wie in meinem Post beschrieben zu deaktivieren. Wenn Du ihn bereits beim Booten/Installieren deaktivieren willst, dann benutze die Anleitung hier: http://www.virtuallyghetto.com/2017/01/esxi-6-5-support-for-apple-mac-pro-61.html. The transaction is not supported: VIB VFrontDe_bootbank_net51-sky2_1.20-2vft.510.0.0.799733 cann ot be live installed. VIB VMware_bootbank_net-sky2_1.20-2vmw.510.0.0.799733 cannot be removed liv e. VIB V-front.de_bootbank_net-sky2-1_1.1.0 cannot be removed live. Thanks to Author, I spent a few hours trying to figure out my issues upgrading from 5.5 to 6.5. The part about misc-drivers saved my bacon, I could not figure out how to get my 8168 realtek to work. When I would add the 8168 vibs like I use to it would remove the misc-drivers vib and then break everything. As a replacement for net-r8168 I used the provided net55-r8168 driver, Thanks again! sorry for the inconvenience ... the package was supposed to replace an existing net-r8168 package, but a bug in its properties prevented that. I have updated the package to do the right thing. Please try again, and your issue should be resolved. try "ping vibsdepot.v-front.de" and "ping6 vibsdepot.v-front.de". Is name resolution and ping working at all? Do you have by chance IPv6 enabled, but no IPv6 Internet connectivity? Then try to disable IPv6. I was able to correct this by connecting via port 80 instead of 443. VIB Realtek_bootbank_net55-r8168_8.045a-napi requires vmkapi_2_2_0_0, but the requirement cannot be satisfied within the ImageProfile. VIB Realtek_bootbank_net55-r8168_8.045a-napi requires com.vmware.driverAPI-9.2.2.0, but the requirement cannot be satisfied within the ImageProfile. So what ESXi version are you currently running? Hi! Let's try it third time. My question is: can I somehow install them without using image (my setup is headless) by, say, deleting net-51 and then installing net-55 without reboot ('cause both of my network cards are realtek). Then DO NOT REBOOT, but install net55-r8168, and reboot then. Thanks! Worked like a charm ) Updated to 6.7 with no issues either!